Usually, the New York Public Library is not on my radar as an exhibition venue. But when I read about Lunch Hour NYC, I knew I had to get there as soon as possible. 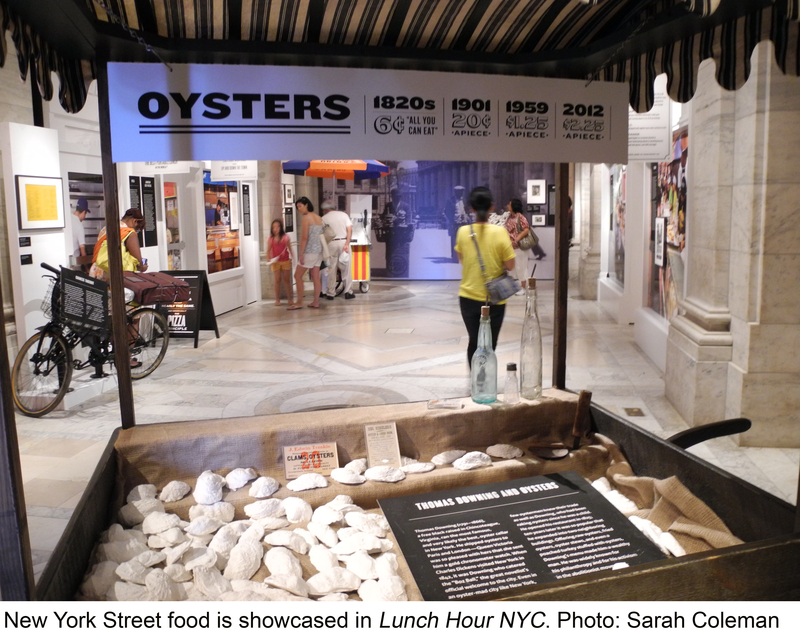 This recently-opened exhibition combines two things that are very dear to my heart: New York City history and food. I went to the library on Monday, walking through Bryant Park during the lunch hour to get there. It was a bright, clear day and the park was full: there were chess players, carousel riders, bookworms and sun worshippers. And everywhere, of course, people were eating lunch. Fragrant clouds of steam wafted from curry, noodles, falafel, pizza, and crepes. If nation states could only coexist as harmoniously as their cuisines do here, we might have a shot at world peace. It wasn’t until the Industrial Revolution that the midday meal got downsized, as the need for speed and convenience arose. Ever innovative and fast, New York embraced the challenge. 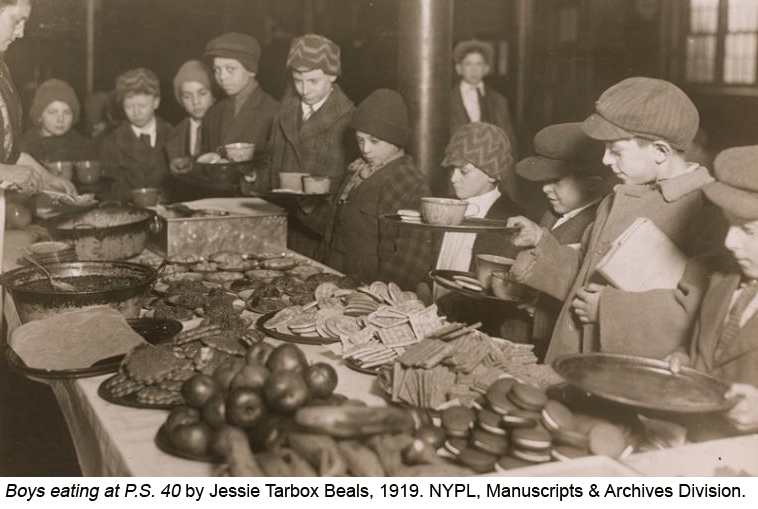 At the beginning of the twentieth century, cafeteria self-serve restaurants like Child’s became popular. Child’s featured community tables, and was known for being spotless. An early photograph in the exhibit shows servers whose long white uniforms made them look more like nurses than waitresses. 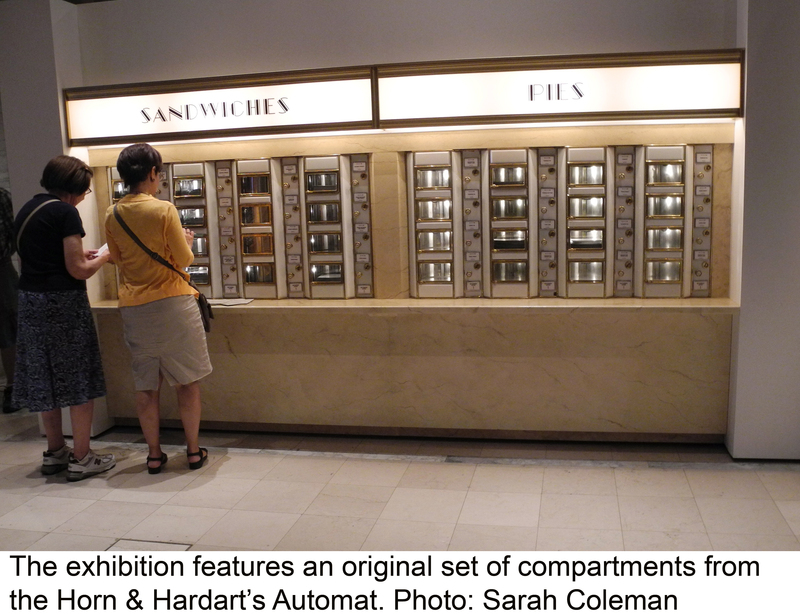 Things were moving fast: in 1912, the cafeteria concept got a reboot when Joe Horn and Frank Hardart opened the first Automat in Times Square. This gleaming two-story marble palace featured banks of compartments that opened when a customer inserted a nickel or two, enabling them to liberate a sandwich or a slab of pie. Thanks to an ingenious revolving drum design, kitchen workers loading the windows were never seen, which gave the futuristic impression that the food had arrived untouched by human hands. 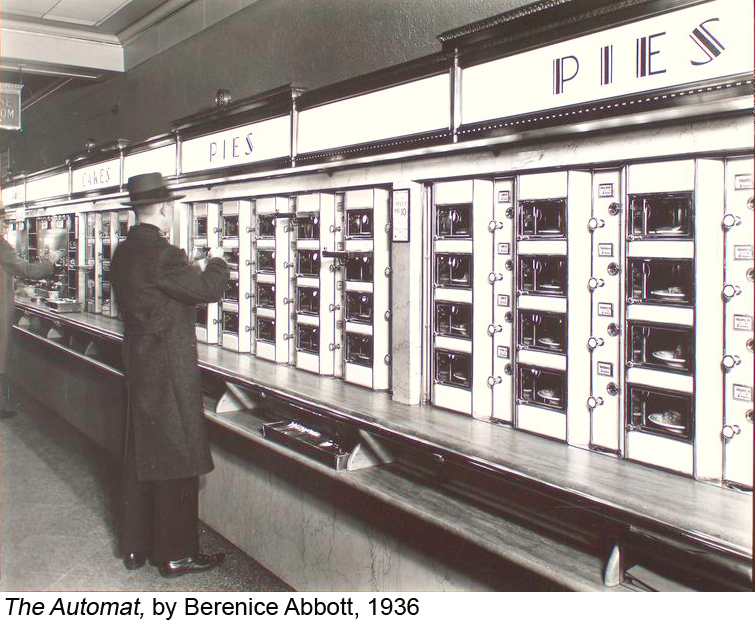 In the 1940s, as food and labor costs soared, the Automat was unable to maintain its high quality and declined, making room for the luncheonette. A narrow counter geared to those who wanted to eat and run, the luncheonette had its own customs and colorful slang. “Belly wash” was soup, “nervous pudding” a jello dessert. “Two in the dark” was two slices of rye bread, toasted. At the same time, places like Delmonico’s and The Four Seasons were catering to high-end clients who wanted to continue business over lunch. A 1979 Esquire article dubbed this practice the “power lunch.” For a long time, women weren’t allowed into these clubby, testosterone-filled environs unless escorted by a man. As early as 1868, this rule prompted sit-in protests by outraged feminists. Lunch Hour NYC touches on other arcane bits of history too. Did you know, for example, that pretzels only became respectable when Prohibition broke their association with beer? Or that peanut butter was initially a gourmet food, designed to be mixed with chopped celery or raisins for a dainty sandwich filling? Or that since 1960 a slice of pizza has always cost roughly the same as a subway ride (locals call this “the pizza principle”)? Pastrami, sushi, and the humble Jamaican beef patty are honored here too—and there are lunch-themed literary and artistic tributes from the library’s collection. W.H. Auden was so devoted to Schrafft’s restaurant that he eulogized it in his 1947 poem In Shraffts; Jack Kerouac sang the praises of Hector’s Cafeteria in On the Road. Artist Claes Oldenburg, known for food-related sculptures, once designed an exhibition catalog prototype in the shape of a Swiss cheese sandwich. You can see it here. 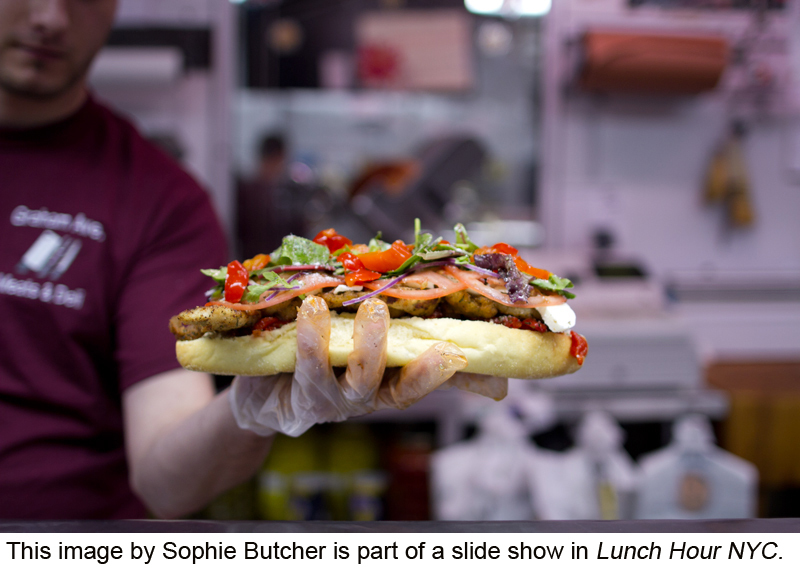 Finally, there’s a slide show of contemporary lunch-themed images from all five boroughs, by photographers including Sophie Butcher, Bettina Johae and Herb Scher. And although the exhibition doesn’t analyze the recent food truck phenomenon, the trucks are being given their due. Various food trucks will be parking outside the library daily from now until Labor Day. So, after taking in as much information as your brain will hold, you can go outside and buy as much food as your hand can hold. 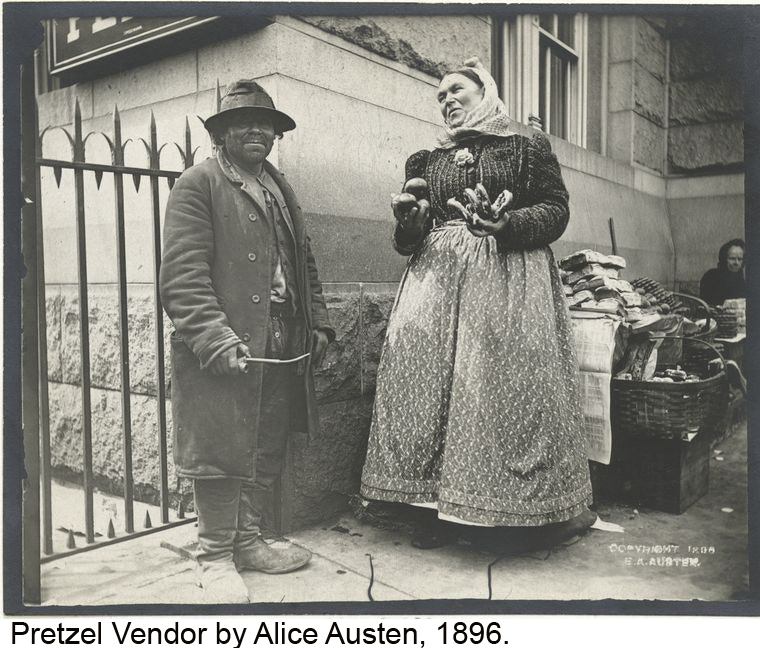 Pretzels, oysters, pastrami, hot dogs… what more delicious way of learning about New York history? Come hungry. 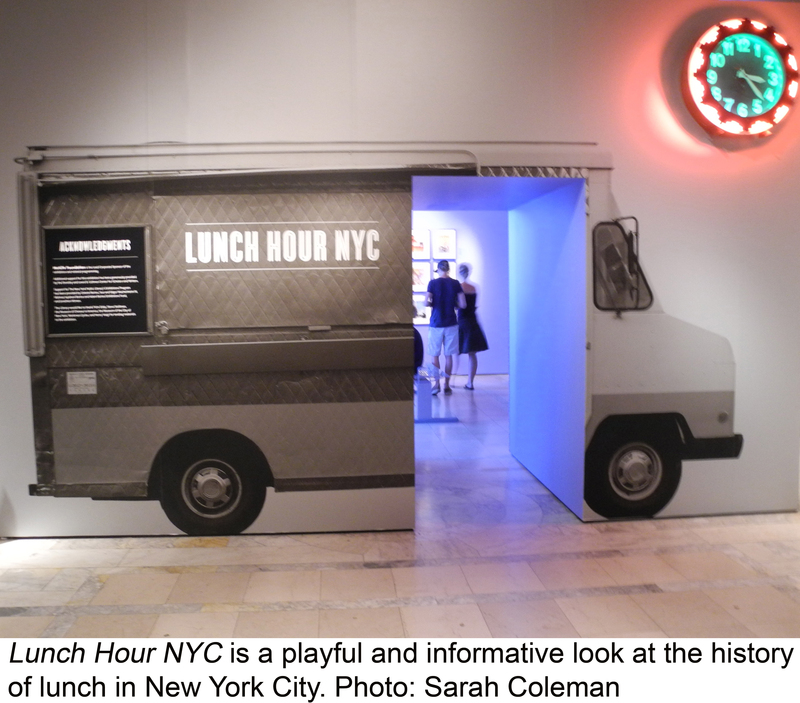 Lunch Hour NYC is on show in the Gottesman Exhibition Hall at the New York Public Library’s Stephen A. Schwarzman Building on 5th Avenue at 42nd Street. For hours, click here. Fascinating read Sarah – feeling peckish already! Fascinating! Thanks for bringing this exhibit to our attention! Loved this. Sorry I missed it on my recent flying visit! Sarah… would you mind revisiting with me? My treat! 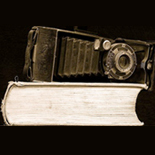 This entry was posted on July 11, 2012 by sarahjcoleman in Exhibitions, Uncategorized.